I don’t have anything against Netflix as a company. I am not a Netflix subscriber, but I think it is great that alternatives to Hollywood are gaining traction (even though Netflix is based in L.A.). More people are exiting the theatre, perhaps annoyed by the lack of creativity and the social agenda being pushed by film makers, in addition to the $25+ per visit price tag that comes with it. You can draw many similarities between the two sectors undergoing massive speculation bubbles: cryptocurrencies and tech stocks. I would designate BitCoin and Netflix as the poster children of the two. Netflix is trying to solve the alternative Hollywood problem just like BitCoin was trying to solve the centralized fiat problem (which it doesn’t). Netflix has name recognition attached to its valuation, as does BitCoin. Both may be early pioneers in their sector but being first has never been a guarantee for success. In fact it usually is a death wish: competitors will sit on the sidelines, learn from your mistakes, and then jump in as the better, more profitable and effective version 2.0 before you have a chance to react. I see that scenario panning out with Netflix as other platforms are beginning to emerge. While Hulu, Amazon and Disney are trying to enter in the arena, and TV and Hollywood not giving up without a fight, Netflix anticipates this threat and is mitigating it with the huge cash sink in its own original productions. Cheerleaders and speculators say this is investing for the future. But how is this strategy sustainable at current levels of revenue and a progressively waning growth in its subscriber base? Unlike BitCoin since cryptocurrencies are not companies and thus have zero growth prospects, Netflix deserves some value as it has a good product and a base of loyal subscribers. But the valuation the current market has given it is not there and never will be. Benjamin Graham is rolling in his grave. Popping another 10% at a 200 price-to-earnings ratio is the new norm thanks to rampant speculation using cheap leverage. Like BitCoin, Netflix stock is reaching peak hysteria, and there is nowhere left to go but down. As more competitors enter the scene, more speculators will realize that Netflix may not be the golden horse to ride on. International exposure has almost been saturated. There aren’t alien planets to expand the customer base further. If everyone in the world knows about Netflix, what exactly are the new prospects for growth? Where is the additional revenue going to come from? Will Netflix have to continue increasing subscriber fees, mine for big data and introduce more tailored advertising? Will they have to introduce micro-transactions and charge per download and for higher quality streams? Team up with governments to spread propaganda for taxpayer money? These gimmicks to fill the revenue gap are customer repellents, but will eventually be necessary to balance the company’s spending spree on original programming. The question isn’t necessarily whether this will be profitable in the long run, it is whether it is so profitable that the stock deserves to be trading at 200 PER. I would wager not. When the market valuation overshoots the realistic valuation this much, expect the oscillation to be wild. If the stock trades at a historically generous (and deserving for a company with moderate growth prospects) 20-40 PER, this stock now priced at 250 per share should instead be in the 25-50 range. That is nearly an 80% drop from today’s valuation to reach that more reasonable valuation. When that drop happens, market psychology will likely send the stock much lower. 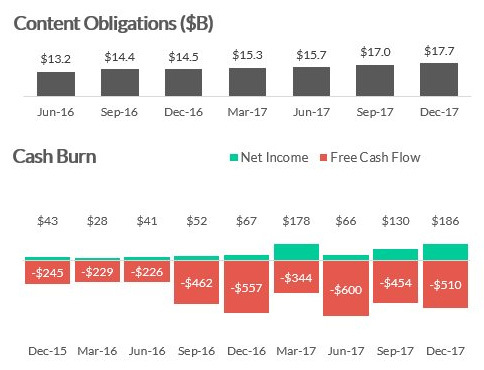 This is why out of the FANG stocks, with Amazon being a close second, I fully expect Netflix to be hit the hardest in the upcoming crash. This crash is destined to happen, provided that the Federal Reserve doesn’t choose a path to hyperinflation that would just delay and create a prolonged depression later. Perhaps when the stock does make its spectacular drop, it would be a good buying opportunity provided that they are still solvent when all the cheap money disappears. Whether you disagree or agree, be sure to leave a comment, share and subscribe to the RSS feed.